Nintendo Switch, the console formerly known as Nintendo NX, has finally had its public debut. There's nothing like seeing a new Nintendo console on the horizon to inspire equal amounts of doe-eyed dreaming and cynical skepticism in the gaming community. But before you decide how hard to start anticipating and/or dismissing Nintendo Switch, take a look at the years-long journey of anonymous reports, rumors, and vague announcements that brought us here. Or in other words, how snitches get Switches. A very early report surfaced of a new console codenamed Nintendo Fusion, which could bridge the gap between Nintendo's disparate home and handheld console efforts. The way it would supposedly work turned out to be a little off - it was positioned as two separate systems that could be unified, rather than one console that could be reconfigured - but still, not bad. The first time Nintendo publicly spoke about Switch, it was almost an afterthought - a quick followup to the announcement that the company was going to start making mobile games. Nintendo tipped its hand on project NX to keep fans (and investors) from fearing that it would abandon its traditional console business in favor of the temperamental mobile market. "I have confirmed that it will be 'a dedicated video game platform with a brand new concept,' it should mean that we do not intend it to become a simple 'replacement' for Nintendo 3DS or Wii U," late Nintendo president Satoru Iwata clarified a few months after announcing NX. Good old patent applications! One of Nintendo's filings indicated that it was working on a new gaming system that would have a slot for memory cards - much like Nintendo DS and 3DS before it - and that turned out to be the case for Switch. Removable cards are well-suited for handheld gaming, since they need fewer breakage-prone moving parts and use less battery power. Reports of NX featuring a "mobile unit" which can be played on the go or used with a home console appeared in The Wall Street Journal, which is typically pretty good at these things. It was an interesting idea at the time, but it turned out to only be half of Switch's new weirdness. It looks like Nintendo Switch does pack some decent power in its little frame, but we don't know enough about it to start making comparisons to other consoles. What we do know for sure is that it doesn't come with an HDMI dongle for wireless streaming - you just slot it into a dock unit which is in turn plugged into your TV. No secret project is complete without a few hoaxes. In this case, one dedicated individual used a 3D printer to manufacture physical mock-ups of Nintendo's patent illustrations. Thankfully, the real Nintendo Switch controllers look nothing like these impossible-to-hold ellipsoid monstrosities. NX wouldn't appear in any form at E3 2016, Nintendo confirmed, but it did have a release window to dull the disappointment: March 2017. And The Legend of Zelda: Breath of the Wild would release simultaneously on NX and Wii U. Though back then the full title hadn't been announced so everybody was still calling it The Legend of Zelda for Wii U. Awkward. After NX skipped E3, original Mario maker Shigeru Miyamoto reassured the world that there was good reason for all the silence: "In terms of NX, there's an idea that we're working on. That's why we can't share anything at this point, and I don't want to comment on the other companies. If it was just a matter of following advancements in technology, things would be coming out a lot quicker". Another patent application hinted at a Nintendo Switch feature that may still be under wraps: a unique force feedback mechanism. The patent outlines a device that uses its speakers in combination with traditional rumble mechanisms to create more convincing feelings of movement. Of course, there's no guarantee that this tech made it into Switch, or that it was ever intended for the system in the first place. Late July 2016: Detachable controller parts? Andddddd here's the other half of what makes Nintendo Switch so unique: the detachable controller segments. How they would work was still up in the air, but the idea that Nintendo was building a handheld system with detachable, reconfigurable hardware that could also plug into your TV opened up whole new avenues of speculation. "The NX is trying to change the concept of what it means to be a home console device or a handheld device," The Pokemon Company CEO Tsunekazu Ishihara said. "We will make games for the NX". The Pokemon Company is partially owned by Nintendo so it was safe to assume he knew what he was talking about. 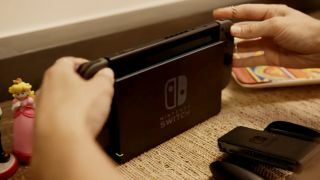 Nintendo ended years of speculation with a three-minute video, introducing Nintendo Switch as single console with various attachments that let it switch from a home console to a traditional handheld to a remote multiplayer station. It also revealed a bunch of untitled games, including a new Mario platformer and Mario Kart. Please don't let there be a delay.